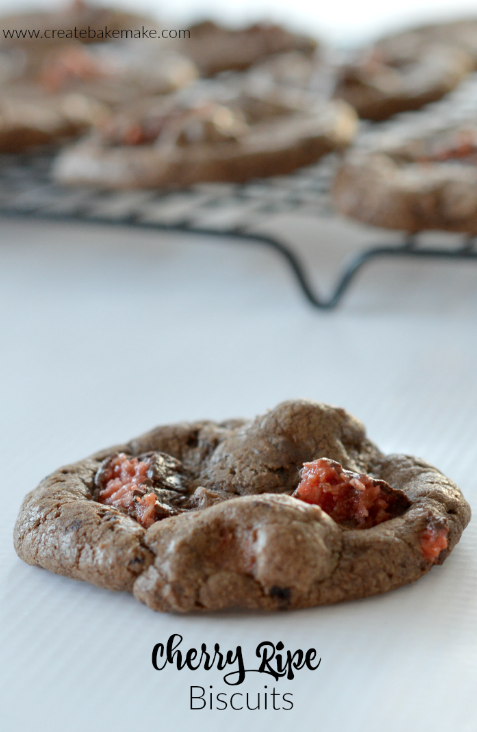 If you thought my Chocolate Snickers Biscuits were yummy, wait until you try these Chocolate Cherry Ripe Biscuits! When I spotted Cherry Ripe bars on special a little while ago I grabbed some with the intention of turning them into my favourite no bake Cherry Ripe Slice, but when I didn’t have any Marie biscuits in the pantry, I instead decided to add them to one of my favourite chocolate biscuit recipes. I’ve made a few variations of this Triple Chocolate Chip Cookie recipe now, and while I was (and still am!) in love with the Snickers version, this Cherry Ripe version has also quickly become a favourite. I kept the pieces of Cherry Ripe quite big as I wanted to be able to bite into them when eating these biscuits, if you are using a Thermomix you could certainly use it to chop up the bars but I prefer to do it myself. 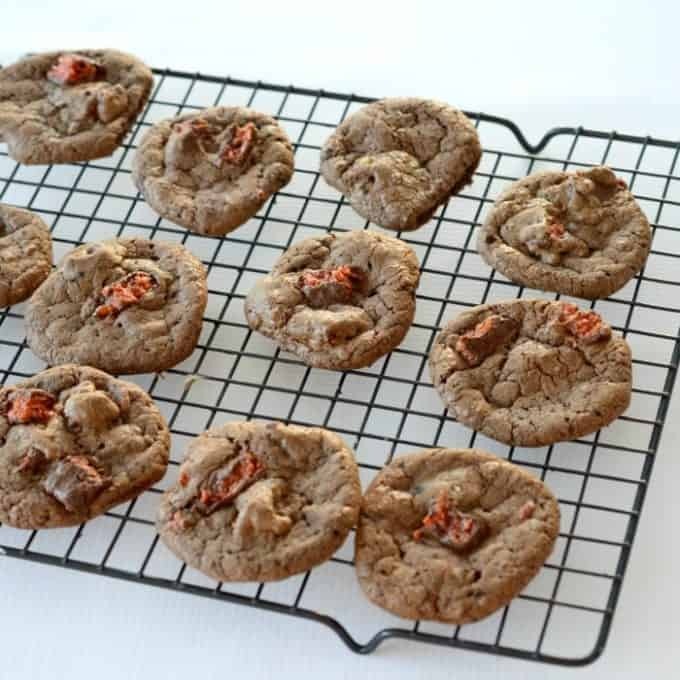 These biscuits do spread quite a bit when baking (thanks to the melted milk chocolate, so make sure you leave plenty of room between them, otherwise you made end up with one giant Cherry Ripe Biscuits – which wouldn’t be that bad I guess! Preheat your oven to 160 degrees and line two baking trays with paper. Cut the Cherry Ripe bars into pieces and set aside until needed. Place the butter and sugars into the bowl of an electric mixer and beat for 8-10 minutes or until the mixture is light and creamy. Add the egg and vanilla extract and mix for a further 3-4 minutes. Add the chopped Cherry Ripe pieces and stir to combine. Place the mixture into the fridge to chill for 15 minutes. Bake for 10-12 minutes or until slight cracks have formed on top of the biscuits. Cool on the baking trays for 5 minutes before carefully transferring to a wire rack to cool completely. Preheat your oven to 160 degrees and line two tray with baking paper. Melt the milk chocolate in the microwave and set aside until needed. Place the butter and brown sugar into your Thermomix bowl and mix for 30 seconds on speed 6. Add the egg and vanilla extract and mix for 20 seconds on speed 4 to combine. Add the flour, cocoa, bicarbonate of soda and the melted milk chocolate and mix for 20 seconds on speed 3 or until combined. Stop after 10 seconds to scrape down the sides and mix for a further 5 – 10 seconds on speed 3 if not combined. Add the Cherry Ripes which have been chopped into small pieces and mix for 20 seconds on speed 3. If the mixture has not quite combined, mix for a further 5 seconds on speed 3. Place the mixture into the fridge for 15 minutes to chill as it will be quite soft. Scoop up tablespoon sized balls of the biscuit mixture and place onto your prepared baking trays. Flatten the surface of the biscuits slightly and place in the oven to bake for 12 – 15 minutes. Carefully remove the biscuits from the oven and let them cool on the baking tray for 10 minutes before carefully transferring them to a wire rack to cool completely. Mu mum loves Cherry Ripes and I always take her some when I go back to the UK. She is going to love one of these with her cuppa! 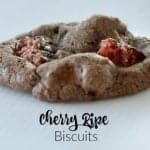 I have a recently acquired taste for Cherry Ripes, I’ll definitely have to give these cookies a go. Yum!